Two days ago, I told you about Presto, the fast-booting Linux OS that's just about perfect for old and/or slow PCs and laptop users who want zippy access to e-mail and the Web. Yesterday, I showed you how to install Presto and get it running. Today, let's turn our attention to using Presto and getting the most from the OS. For starters, anyone accustomed to Windows will notice that there's no taskbar. So, how do you switch between running programs (or just see what programs are running)? You have two options. First, you can hold down the Alt key and tap Tab to cycle between open apps, Windows-style. Second, you can click the Windows List icon in the toolbar--it resides just above the green power button. Want to install new software? Click Application Store in the toolbar, then click the eponymous icon in the window that appears. Here you can find GIMP, Picasa, Thunderbird, and countless other programs (almost all of them open-source, meaning free). To install anything, just click the corresponding green Install button. Next, Presto can import bookmarks from your Windows version of Firefox (though I think you're better off installing Xmarks, formerly Foxmarks, which seamless syncs your bookmarks across all your Firefox installations). Click the little Settings icon in the toolbar (just above the clock), then click Import Bookmarks. 1. Press Ctrl-Alt-T to bring up Presto's DOS-like terminal window. 2. 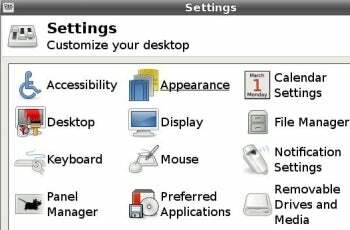 Type xfce4-settings-manager, then hit Enter. 3. Click the system setting you want to adjust. That's it! Now go forth and enjoy your fast-booting, Web-friendly "new" PC.